Supplied as established plants in 1.5L pots on a cane, ready to plant out, about 70cm tall. 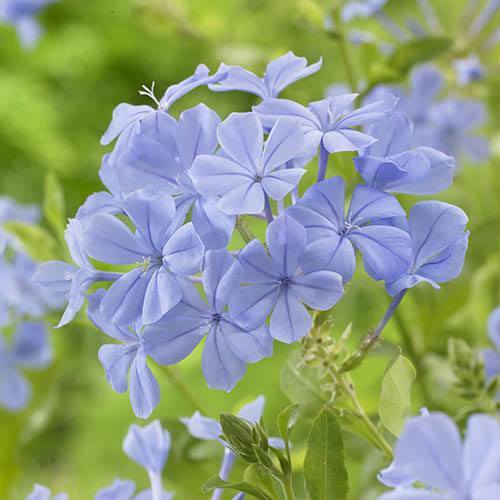 A superb summer patio plant, adding a tropical flavour to your garden or patio - their clear sky blue flower clusters smother this informal climbing shrub, which works well in large pots with cane supports. Grow outside all summer, it will need winter protection, as can be damaged below 2C, but will regrow away the following year when it warms up again. The phlox-like flowers are subtly scented and will attract butterflies and hoverflies into your garden. A great colour addition for summer long colour, and unusual too. Supplied in flower in a 1.5L pot, approx 70cm tall on a cane.